Are your social media profiles helping your business be found on search engines? Yes that’s right – search engines now rank social media sites in their results. This means whatever words you are frequently using on social media pages will count towards your search rank. Higher social media ranking equals more traffic to your website! It highlights how important it is now to research and use your specific keywords on all your business profiles. 1. Choose the right keywords – do your research! Using keywords on your social media pages is similar to using keywords on your website. You need to find words that relate or are specific to your business. 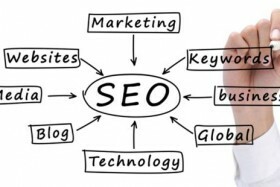 Do your research and find out how many people are searching these words – if you are undertaking SEO on your website, it may be worthwhile utilising those same keywords. WordTracker is a great tool to get started researching your keywords. For example, if you’re an accountant in Melbourne, you could post statuses about ‘Accountants Melbourne’. 2. Make sure your usernames are concise. 3. Let your keywords guide your content. If you’re not sure what to talk about on your social media profiles, you should let your keywords guide you. An important aspect is to ensure you don’t sound unnatural when doing this; keep it fresh and impersonal so your audience doesn’t get suspicious. An example of a keyword might be “Web Design Melbourne,” then next time you’re posting about a local creative event happening in Melbourne, you could use this keyword in the update. 4. Use your keywords in your images. When you’re uploading or about to post any images or files (i.e. PDF’s, Word Docs), make sure you rename them to include a keyword or two. Never upload anything with generic titles such as image01.png. Regularly link to items on your website, such as blog posts or special offers. You should also cross-link between your website and your other social profiles, such as linking from Facebook to YouTube or Twitter to your Facebook or website! Include a link to your website in every online profile, bio, or directory listing you have – such as Twitter, Facebook, Squidoo, Google+, LinkedIn, YouTube, Yelp, Tumblr, Pinterest, Yellow Pages… the list goes on! Head on over to Google and do a search for your business name. A lot of people find they’re listed on a bunch of directory websites, but without a link. Make sure that all of your details are up-to-date, with a link through to your website. 8. Utilise social bookmarking sites. If you can get more links, you will improve your social media rank. Use sites like StumbleUpon, Digg, and Reddit to link back to content on your website and help improve your SEO coverage. 9. Include keywords in your Headlines and About section. Try and place your keywords in all your profiles or info sections. For example, on your Facebook ‘Info’ page, make sure you have utilised your essential keywords! Your keywords should relate strongly to your business, so tying them into your online bio should be a cinch. 10. Use your competitors to your advantage. Research your competitors’ social pages and see what keywords they’re using. You may be able to outdo them for certain keywords, or they may give you ideas for even better keywords to use instead. Now implement those high-ranking keywords to your strategy and beat them to the top of Google! Regularly LOG OUT of Google and try searching for your keywords to see how you’re doing. Google remembers your searches so you might even try checking from a friend’s computer or your mobile phone. Keep a simple spreadsheet to see which terms are showing up where. (Tip: Try searching both “as a phrase” and just the words). Learn to use social media to your business’ advantage. By implementing these 11 small steps to your everyday social media strategy, you will soon be ranking at the top of Google and attracting the right prospects through your social efforts!